MormonInfo.org - False Prophecies - Why did Smith say that the Book of Mormon copyright would sell in Canada and it didn't? 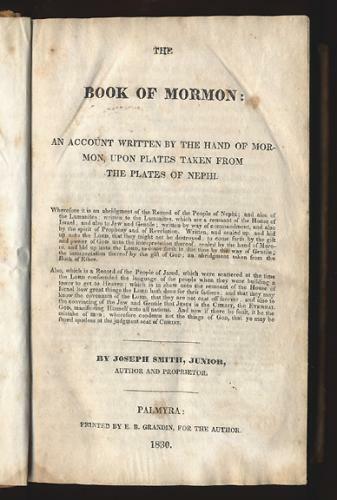 Brother Hyrum said it had been suggested to him that some of the brethren might go to Toronto, Canada, and sell the copy-right of the Book of Mormon for considerable money: and he persuaded Joseph to inquire of the Lord about it. Joseph concluded to do so. He had not yet given up the stone. Joseph looked into the hat in which he placed the stone, and received a revelation that some of the brethren should go to Toronto, Canada, and that they would sell the copy-right of the Book of Mormon. Hiram Page and Oliver Cowdery went to Toronto on this mission, but they failed entirely to sell the copy-right, returning without any money. Joseph was at my father's house when they returned. I was there also, and am an eye witness to these facts. Jacob Whitmer and John Whitmer were also present when Hiram Page and Oliver Cowdery returned from Canada. Well, we were all in great trouble; and we asked Joseph how it was that he had received a revelation from the Lord for some brethren to go to Toronto and sell the copy-right, and the brethren had utterly failed in their undertaking. Joseph did not know how it was, so he enquired of the Lord about it, and behold the following revelation came through the stone: 'Some revelations are of God: some revelations are of men: and some revelations are of the devil.' So we see that the revelation to go to Toronto and sell the copy-right was not of God, but was of the devil or of the heart of man. When a man enquires of the Lord concerning a matter, if he is deceived by his own carnal desires, and is in error, he will receive an answer according to his erring heart, but it will not be a revelation from the Lord. This was a lesson for our benefit and we should have profited by it in future more than we did (An Address to All Believers in Christ, 31). LDS Jeff Lindsay said concerning this testimony that it was from a hostile secondary source long after the actual event, so Whitmer’s "recollection of the event may have been colored by his feelings" (emphasis added). In terms of what happened in history, anything is possible, but not everything is probable. Lindsay simply throws out the mere possibility that Whitmer was an unreliable witness at this point. Of course LDS often use Whitmer when it is to their advantage in supporting the Book of Mormon: "Even though he became an apostate, he never denied his testimony of the Book of Mormon." So Whitmer was reliable in his witness of seeing the Book of Mormon gold plates, because the Book of Mormon simply has to be true and Joseph Smith must really be a prophet of God! But Whitmer was unreliable in his witness of this alleged Canadian revelation, primarily because the Book of Mormon simply has to be true and Joseph Smith must really be a prophet of God! In other words, nothing can ever be said that would count as an honest and accurate recollection against the Book of Mormon and Joseph Smith being a prophet of God. Another point to keep in mind about this Whitmer statement is that it was not a negative recollection in his mind. Again, he said that this was a "lesson for our benefit and we should have profited by it in future more than we did." Later he said concerning how revelations come about, "[T]his is God’s way of dealing with His people." Whitmer said that Smith and others, including himself, all gave true prophecies when they were humble, but when they were not, they gave false prophecies. Apparently, this event was not one of the things that made Whitmer hostile toward Smith and the developed LDS Church. So contrary to Lindsay’s suggestion, hostile feelings could not have colored this recollection. Now with the recent release of the Joseph Smith Papers (JSP), Smith’s actual revelation has been brought to light. It indicates that Kingston, not Toronto—contra Whitmer, was to be the town in Canada where the Lord instructed Oliver Cowdery, Joseph Knight, Hiram Page, Josiah Stowel to go to sell the copyright if the “[p]eople hardened not their hearts.” (Whitmer mentioned only Cowdery and Page as going, but that does not entail Whitmer would have ruled out others.) The followers never went to Toronto, but went back to Palmyra after their journey to Kingston. In a later account, Page affirms the revelation of Smith by saying they were to go to Kingston and sell the copyright “if they would not harden their hearts.” Page claimed they were told in Kingston that they could not sell a copyright there, but had to go to Toronto for that. He claimed they were treated with the best of respect, and he gave no indication that they hardened their hearts. So for most LDS, the problem now turns on a conditional, and for them the people did evidently harden their hearts and did not want anything to do with the Book of Mormon. In other words, Smith’s revelation actually says something to the effect of: "So, those guys will be successful in selling the copyright IF they'll do it with an eye single to the glory of God AND if the people up there harden not their hearts" (Steven C. Harper [one of the editors of the JSP]). Even though there is no indication that Smith’s followers felt the people in Kingston hardened their hearts, LDS by and large today assumed that must be what happened. The followers could have sold it only if the people in Kingston were willing to buy. Yet here is another possibility: the people in Kingston were actually willing and told the truth when they said that a copyright could only be sold in Toronto. If that’s the case, then Smith gave the wrong town in his “revelation.” The only way to figure this out is by doing historical and legal research on whether Kingston had that capability. This is what LDS Don Bradley concluded in a recent LDS discussion board. Given that the followers never implicated the Kingston people for their hardness of heart, given that Whitmer as well as Page were very willing to learn how received revelations may not come to pass (in 1848, Page concluded from all this, “[W]e may learn how a revelation may be received and the person receiving it not be benefitted”), and given Whitmer’s claim that Smith said that some revelations are of God, some of man, and some of the devil (an explanation reminiscent of D&C 46:7), the facts seem to suggest that Smith deceived these individuals into thinking this was the Lord’s will when it actually was simply Smith’s or Satan’s will. If the latter was the case, then this false prediction was taking God’s name in vain, and is indicative of someone who was not a prophet of God according to Deuteronomy 18:20-22. If Smith could not be trusted here, then it would make sense for at least Whitmer to question his testimony of the Book of Mormon. And if he should have questioned it as one of the witnesses to the Book of Mormon, then everyone else should question it as well.